The metabolic syndrome is a risk factor for the development of diabetes and cardiovascular disease; however, no prospective studies have examined the metabolic syndrome as a risk factor for chronic kidney disease (CKD). A total of 10,096 nondiabetic participants who were in the Atherosclerosis Risk in Communities study and had normal baseline kidney function composed the study cohort. The metabolic syndrome was defined according to recent guidelines from the National Cholesterol Education Program. Incident CKD was defined as an estimated GFR (eGFR) <60 ml/min per 1.73 m2 at study year 9 among those with an eGFR ≥60 ml/min per 1.73 m2 at baseline. After 9 yr of follow-up, 691 (7%) participants developed CKD. The multivariable adjusted odds ratio (OR) of developing CKD in participants with the metabolic syndrome was 1.43 (95% confidence interval [CI], 1.18 to 1.73). Compared with participants with no traits of the metabolic syndrome, those with one, two, three, four, or five traits of the metabolic syndrome had OR of CKD of 1.13 (95% CI, 0.89 to 1.45), 1.53 (95% CI, 1.18 to 1.98), 1.75 (95% CI, 1.32 to 2.33), 1.84 (95% CI, 1.27 to 2.67), and 2.45 (95% CI, 1.32 to 4.54), respectively. After adjusting for the subsequent development of diabetes and hypertension during the 9 yr of follow-up, the OR of incident CKD among participants with the metabolic syndrome was 1.24 (95% CI, 1.01 to 1.51). The metabolic syndrome is independently associated with an increased risk for incident CKD in nondiabetic adults. The metabolic syndrome, also known as the insulin resistance syndrome, is characterized by abdominal obesity, dyslipidemia, hypertension, and hyperglycemia and is present in approximately 20% of US adults (1). Individuals with the metabolic syndrome are at increased risk for diabetes and cardiovascular disease (2), as well as cardiovascular and all-cause mortality (3,4). The prevalence of chronic kidney disease (CKD) is also rising, affecting approximately 8 million adults in the United States (5). Cross-sectional studies have demonstrated a link between the metabolic syndrome and CKD (6,7). However, whether the metabolic syndrome contributes to the development of CKD is unknown. Diabetes is a major risk factor for the initiation and progression of CKD (8,9), and individuals with evidence of the metabolic syndrome have a substantial risk for developing type 2 diabetes over time (2). Epidemiologic studies have linked the metabolic syndrome with an increased risk for microalbuminuria, an early marker of kidney injury (7,10–13); few studies have evaluated the relation between the metabolic syndrome and CKD (6,7). These studies have been limited by cross-sectional design, the inclusion of subjects with diabetes, and the use of proxies of insulin resistance, rather than recently proposed clinical criteria defining the metabolic syndrome (14). To date, no prospective longitudinal studies have examined the risk for CKD among individuals with the metabolic syndrome. It remains unclear whether the syndrome is a cause or a consequence of reduced kidney function and whether the associations are independent of diabetes. To determine whether the metabolic syndrome was associated with the development of CKD, we examined data from a large, community-based, prospective cohort of adults. We hypothesized that among individuals with normal or near-normal kidney function at baseline, the metabolic syndrome would be associated with the development of CKD over time. Moreover, we hypothesized that this association would be independent of diabetes and hypertension, the leading causes of CKD in the United States. The Atherosclerosis Risk in Communities (ARIC) Study is a prospective longitudinal study of cardiovascular disease risk factors (15). The ARIC cohort consists of >15,000 black and white individuals aged 45 to 64 at study entry, sampled at random from four US communities: Forsyth County, NC; Jackson, MS; Minneapolis, MN; and Washington County, MD. Only black individuals were sampled in Jackson, MS. Study participants were enrolled from 1987 to 1989 and then returned for three follow-up visits at 3-yr intervals. The serum creatinine concentration was measured at visit 1 (baseline) and visit 4 (9 yr after baseline). To better estimate kidney function, we calculated the estimated GFR (eGFR) using the abbreviated Modification of Diet in Renal Disease (MDRD) study equation: 186 × serum creatinine (mg/dl)−1.154 × age−0.203 × (0.742 if female) × (1.212 if black) (16). We defined CKD as an eGFR <60 ml/min per 1.73 m2. For the analyses described here, we excluded participants with baseline CKD (n = 614) and baseline diabetes (n = 1745), the latter defined as a fasting plasma glucose ≥126 mg/dl, self-reported diabetes, or the use of medications for diabetes. We also excluded participants with missing data for components of the metabolic syndrome (n = 224) and those without 9-yr follow-up serum creatinine measurements (n = 3203), yielding an analytic cohort of 10,096 individuals. Demographic, anthropometric, and laboratory data were collected on all participants at baseline and updated at each follow-up visit. Information regarding age, race, gender, education, comorbidity, and lifestyle factors was obtained by home interview. Coronary heart disease was defined as a history of myocardial infarction or coronary revascularization procedure. Regular physical activity was defined as at least one physical activity for at least 1 hr per week for 10 mo or more per year (17). BP was measured using a random-zero sphygmomanometer after the participant had been seated for 5 min, and the average of two measurements was recorded. Circumferential measurements of the waist measured at the umbilicus were performed with the participant standing and rounded to the nearest centimeter. Fasting blood specimens were used for measurement of lipids, glucose, and insulin levels. Lipids were measured by enzymatic assay (18), and insulin levels were measured by RIA (125Insulin Kit; Cambridge Medical Diagnostics, Billerica, MA). Insulin resistance was assessed using the Homeostasis Model Assessment (HOMA): Fasting serum insulin (μU/ml) × fasting plasma glucose (mg/dl)/405 (19). Serum creatinine was measured using a modified kinetic Jaffe method and indirectly calibrated for variance between ARIC measurements and those of the MDRD clinical laboratories (20). We defined the metabolic syndrome as three or more of the following criteria, according to the National Cholesterol Education Program Third Adult Treatment Panel guidelines (14): (1) waist measurement >88 cm for women or >102 cm for men, (2) triglycerides ≥150 mg/dl, (3) HDL cholesterol <50 mg/dl for women or <40 mg/dl for men, (4) BP ≥130/≥85 mmHg or the use of BP medications, and (5) fasting glucose ≥110 mg/dl. Because some authorities have recently advocated for lowering the threshold used to define impaired fasting glucose to ≥100 mg/dl (21), we explored this alternate definition of the metabolic syndrome in secondary analyses. We defined incident CKD as an eGFR <60 ml/min per 1.73 m2 at study year 9 after an eGFR ≥60 ml/min per 1.73 m2 at baseline. In secondary analyses, we used gender-specific serum creatinine cutoffs (for men, serum creatinine ≥1.5 mg/dl; for women, serum creatinine ≥1.2 mg/dl) to define incident CKD. Continuous variables were expressed as mean ± SD and compared using t test. Categorical variables were expressed as a percentage and compared using the χ2 test. We used logistic regression to determine the odds ratio (OR) of CKD as a function of the metabolic syndrome. First, we conducted unadjusted analyses using the number of metabolic syndrome traits or the presence/absence of the metabolic syndrome (three or more traits) as the independent variable. Next, we adjusted for demographic factors: Age, gender, and race. In multivariable models, we included variables that might confound the relation between the metabolic syndrome and CKD: Education, body mass index (BMI), current alcohol and tobacco use, prevalent coronary heart disease, and physical activity. We also examined the OR of CKD using as dependent variables the quintiles of HOMA-insulin resistance or fasting insulin. We checked for effect modification of the metabolic syndrome–CKD relation by including interaction terms for age, gender, and race. We used similar procedures to evaluate the OR of CKD for each component of the metabolic syndrome. Because hypertension is a risk factor for CKD, we examined whether exclusion of participants with baseline hypertension changed the effect estimates. Finally, we fit additional models adjusting for incident diabetes and hypertension during the 9-yr follow-up to explore whether these factors fully explained any association that might have been demonstrated between the metabolic syndrome and CKD. We considered two-tailed P < 0.05 as statistically significant. We used SAS Version 8.2 (Cary, NC) for all statistical analyses. Of the 10,096 participants included in the analytic cohort, the mean age was 53.7 ± 5.6 yr, 44% were male, and 20% were black. Participants who did not have follow-up serum creatinine measurements were on average 1 yr older (P < 0.001) and had an eGFR approximately 3 ml/min per 1.73 m2 higher (P < 0.001) than those who were included in the analytic cohort. Those who were excluded from the analytic cohort were also more likely to be male and black and to meet criteria for the metabolic syndrome (P < 0.001 for all). Twenty-one percent of participants in the analytic cohort (n = 2110) met criteria for the metabolic syndrome at the initial visit (Table 1). In contrast to participants without the metabolic syndrome, those with the metabolic syndrome were slightly older, more likely to have coronary heart disease, and less likely to use alcohol or have regular physical activity. As expected, BP, glucose, insulin, and lipid measurements were significantly different between the two groups. In addition, baseline eGFR was slightly higher for those with the metabolic syndrome. The frequency of each trait of the metabolic syndrome differed significantly by gender and race (Figure 1). For example, women were more likely to have abdominal obesity, whereas men had a higher frequency of dyslipidemia and hyperglycemia (P < 0.001 for all). Blacks had a higher frequency of abdominal obesity, hypertension, and hyperglycemia, whereas lipid abnormalities were more common among whites (P < 0.001 for all). Frequency of metabolic syndrome traits by gender. TG, triglycerides; HTN, hypertension. Frequency of metabolic syndrome traits by race. Seven percent (n = 691) of the analytic cohort developed CKD after 9 yr of follow-up. In unadjusted analyses, the metabolic syndrome was associated with a significantly increased risk for CKD (OR, 1.69; 95% CI, 1.42 to 2.00; Table 2). The risk did not substantially differ by gender or race (interaction terms NS). The risk for CKD varied modestly by age (P = 0.04 for interaction), such that those who were older than 60 yr had a slightly greater risk for CKD (OR, 1.74; 95% CI, 1.35 to 2.50) than those who were younger than 60 yr (relative risk [RR], 1.49; 95% CI, 1.17 to 1.89). After adjustment for demographic factors and additional adjustment for education, BMI, coronary heart disease, and lifestyle factors, the increased risk for CKD (OR, 1.43; 95% CI, 1.18 to 1.73) remained significant. The results were not changed after further adjustment for the use of angiotensin-converting enzyme inhibitors at baseline (OR, 1.41; 95% CI, 1.16 to 1.71). Exclusion of BMI, which is closely associated with the metabolic syndrome, from the multivariable models did not appreciably change the effect estimates presented here. Similarly, when we used the lower glucose cutoff (fasting glucose ≥100 mg/dl) to define impaired fasting glucose, the association was not changed (OR, 1.49; 95% CI, 1.28 to 1.74). The increased risk for CKD was observed even among the 372 individuals with the metabolic syndrome and normal BP (RR, 1.46; 95% CI, 1.08 to 1.97). We performed companion analyses using gender-specific serum creatinine cutoffs to define CKD rather than eGFR. Using this alternate definition, the results were effectively unchanged. The metabolic syndrome remained significantly associated with an increased risk for incident CKD (OR, 1.60; 95% CI, 1.11 to 2.30). We then assessed whether the association between the metabolic syndrome and CKD was related to the number of metabolic syndrome traits. The prevalence of zero, one, two, three, four, or five traits of the metabolic syndrome was 26, 30, 23, 15, 5, and 1%, respectively (Figure 2). Relative to those with no traits of the metabolic syndrome, there was a significant, stepwise increase in the risk for CKD with each additional trait. After adjustment for potential confounding factors, there remained a significant increased risk for CKD for those with two or more traits of the metabolic syndrome (Table 3). There was a significant step-up in risk for those who met all five criteria, with an almost 2.5-fold increased risk for CKD (OR, 2.45; 95% CI, 1.32 to 4.54). A similar pattern was observed between HOMA-insulin resistance and the risk for CKD (Table 4). After adjustment for demographics and other confounders, those in the highest quintile of HOMA-insulin resistance had a 70% increased risk for CKD (OR, 1.70; 95% CI, 1.26 to 2.30). Almost identical results were seen among quintiles of fasting insulin and the risk for CKD. For example, for those in the highest quintile of fasting insulin (>14 μU/ml), the OR was 1.86 (95% CI, 1.39 to 2.48). 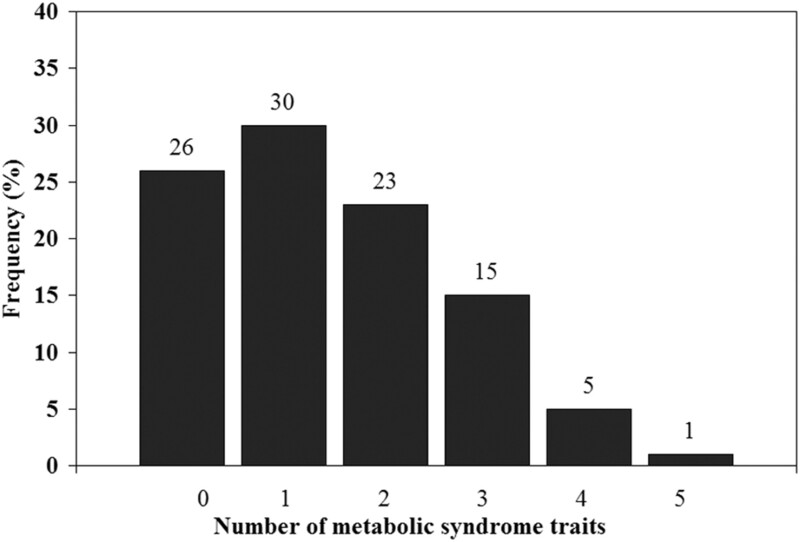 Distribution of metabolic syndrome traits in study participants. We also examined the association of individual traits of the metabolic syndrome and the risk for CKD. With the exception of impaired fasting glucose, each trait of the metabolic syndrome was associated with a significantly increased risk for CKD (Table 5). Although the prevalence of several traits differed by gender and race, these characteristics did not substantially modify the association between each trait and the risk for CKD. 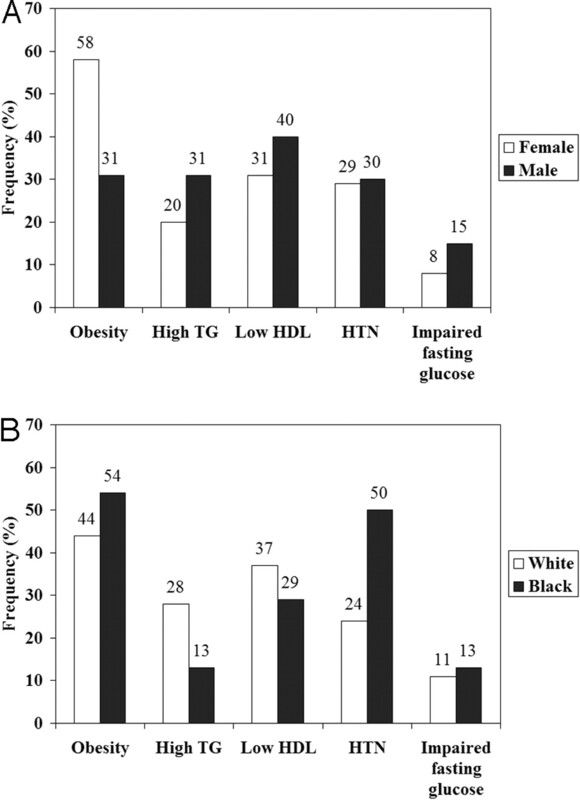 For example, although obesity was more common in women and hypertension was more common in blacks, the risk for CKD associated with these traits was not different by gender and race, respectively. To explore whether the risk for CKD in individuals with the metabolic syndrome was mediated by the subsequent development of diabetes or hypertension, we fit additional models adjusting for incident diabetes and hypertension at follow-up (note: individuals with baseline diabetes were excluded from the analysis). Over 9 yr of follow-up, 10% of the cohort developed incident diabetes and 19% developed hypertension. After inclusion of incident diabetes and hypertension, the association between the metabolic syndrome and incident CKD remained statistically significant (RR, 1.24; 95% CI, 1.01 to 1.51). We also compared baseline and follow-up BP measurements stratified by the presence of hypertension to explore whether the difference in CKD incidence might be explained by differences in BP over time. Among those without baseline hypertension, baseline mean systolic BP (116 versus 112 mmHg) and mean diastolic BP (71 versus 69 mmHg) were significantly higher in individuals with the metabolic syndrome (P < 0.0001 for both comparisons). After 9 yr of follow-up, mean systolic BP (125 versus 122 mmHg) was significantly higher in individuals with the metabolic syndrome (P < 0.001), although mean diastolic BP (69 versus 70 mmHg) was not (P = 0.47). Among those with baseline hypertension, baseline and follow-up BP measurements did not differ by the presence or absence of the metabolic syndrome. Although individual components of the metabolic syndrome have been implicated in the development or progression of CKD, few studies have examined the joint effect of these commonly observed clinical traits. Several cross-sectional studies have noted an association between the metabolic syndrome, defined by recent guidelines, or proxy measures of insulin resistance and microalbuminuria in individuals with and without diabetes (7,10–13). Two studies previously examined the association between the metabolic syndrome and CKD, both using data from the Third National Health and Nutrition Examination Survey (NHANES III). In a cross-sectional analysis of nondiabetic adults in NHANES III, Chen et al. (6) demonstrated correlations among insulin resistance, hyperinsulinemia, and the prevalence of CKD. These authors also reported a 2.6-fold increased prevalence of CKD among adults in NHANES III with the metabolic syndrome using the clinical definition used here (7). Using data from participants in the ARIC Study, a large, prospective, community-based cohort, we demonstrated that the metabolic syndrome, absent diabetes, is associated with an increased risk for incident CKD, defined as progression to eGFR <60 ml/min per 1.73 m2 over a 9-yr period. The risk was independent of potential confounding factors such as age, gender, race, education, BMI, alcohol and tobacco use, coronary heart disease, and physical activity. There were graded relations among the number of clinical traits of the metabolic syndrome, HOMA-insulin resistance, and fasting insulin levels and the risk for CKD, suggesting a pathophysiologic basis for these findings. Moreover, the increased risk for CKD was evident even after adjusting for hypertension (a potential cause and consequence of kidney disease) and incident diabetes, another known mediator of CKD. In sum, these findings suggest that the metabolic syndrome directly contributes to the development of CKD. The difference in risk reported in our study and a previous cross-sectional study (7) may reflect several factors, including confounding by the inclusion of individuals with diabetes and the degree to which reduced kidney function may be a cause of insulin resistance. Nevertheless, because the metabolic syndrome is present in a considerable fraction of the nondiabetic adult population (22), this study identifies a large, previously not well-recognized segment of the population for whom CKD risk reduction efforts may be beneficial. The mechanisms of hypertensive and diabetic injury leading to CKD have been well described (23–25). In this study, the association between the metabolic syndrome and CKD in nondiabetic individuals remained robust even after accounting for the subsequent development of diabetes and hypertension, suggesting that the risk for CKD is not solely attributable to these conditions. Obesity is implicated in the development focal segmental glomerulosclerosis and glomerulomegaly (26,27) and has also been associated with an increased risk for ESRD in some but not all studies (28,29). Several lines of evidence suggest that dyslipidemia may be an important factor in the development and progression of CKD. Observational data and a recent meta-analysis suggest that elevated triglycerides and low HDL are independent risk factors for the development or acceleration of CKD and that the use of statins may slow CKD progression (30–34). Others have speculated a direct role for insulin resistance and hyperinsulinemia (35), inflammation resulting from lipotoxicity (36,37), reduced nephron number, and increased excretory load (38,39). This study has several strengths, including the large, community-based biracial sample, long duration of follow-up, exclusion of individuals with diabetes, adjustment for a number of potential confounding factors, and the use of a clinically meaningful end point (eGFR < 60 ml/min per 1.73 m2) rather than a surrogate marker of kidney injury. Nevertheless, several limitations may affect the interpretation of these results. We excluded individuals without follow-up serum creatinine measurements. Because these individuals were older and more likely to have the metabolic syndrome, exclusion of these individuals would be expected to bias the study results toward the null. We did not have measurements of urinary protein excretion; thus, some of the individuals who were included in the analytic cohort may have had incipient kidney disease with normal kidney function. Early effects of the metabolic syndrome may include an increase rather than decrease in GFR, owing to the effects of insulin and IGF-1, which promote glomerular hyperfiltration (40,41). To the degree that proteinuria leads to CKD independent of the metabolic syndrome, the results presented here may have overestimated the risks associated with the metabolic syndrome. However, as with hypertension (or more so), proteinuria is more likely a consequence rather than a cause of CKD. We used eGFR rather than directly measured GFR to define CKD. Differential misclassification of individuals with borderline CKD also may have resulted in biased estimates. However, when we used gender-specific serum creatinine cutoffs rather than eGFR to define CKD, the results were unchanged, suggesting that the findings presented here are robust. The current definition of the metabolic syndrome gives equal weight to each trait, an assumption that may not necessarily be valid, because each trait may not contribute equally to the risk for CKD (as suggested in Table 5). Although we accounted for differences in the prevalence of hypertension at baseline and follow-up and conducted secondary analyses in which individuals with baseline and incident hypertension were excluded, we cannot rule out the possibility that subtle differences in BP over time may have contributed to CKD risk. Finally, our findings do not rule out the possibility that the metabolic syndrome is a marker and not a causative factor in the development of CKD. Interventional studies that target the components of the metabolic syndrome are needed to clarify these putative mechanisms of kidney injury. In summary, we found that nondiabetic adults with the metabolic syndrome had an increased risk for developing CKD over 9 yr of follow-up, independent of baseline confounding factors and the subsequent development of diabetes and hypertension. Future studies should address whether weight reduction, exercise, and other measures to increase insulin sensitivity, as well as interventions that directly target biochemical components of the metabolic syndrome, may reduce the risk for CKD in these individuals. M.K. was supported by the ASN-ASP-Junior Development award in Geriatric Nephrology, funded through Atlantic Philanthropies, the American Society of Nephrology, and the John A. Hartford Foundation. J.C.L. was supported by National Institutes of Health-National Institute of Neurological Disorders and Stroke Grant K12 AR47659. G.M.C. was supported by National Institutes of Health–National Institute of Diabetes and Digestive and Kidney Diseases Contract N01-DK-1-2450. The interpretation and reporting of these data are the responsibility of the authors and in no way should be seen as an official policy or interpretation of the US government. The ARIC Study is conducted and supported by the National Heart, Lung, and Blood Institute (NHLBI) in collaboration with the ARIC Study Investigators. This manuscript was not prepared in collaboration with the investigators of the ARIC Study and does not necessarily reflect the opinions or views of the ARIC Study or the NHLBI.